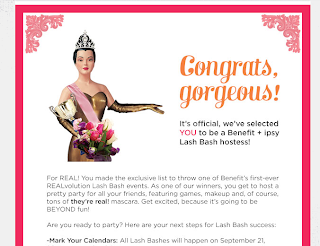 Neya V Beauty Talk: Lash Bash Party! I am happy to announce that I have been selected to host a Lash Bash Party by Benefit and Ipsy! I'm so excited! At first, I wasn't even going to enter the contest. My thoughts were: I don't know 9 people I can invite and I never win anything so there's no point. I'm so happy that I decided to enter anyways. I'm excited to start planning it. The first thing I have to do is put together my guest list and send out invites. Here I'll updates on my planning and once the party finally arrives I'll post pics and videos! Keep tuned ladies!